This month, Kiki Yablon, KPA CTP, CPDT-KA, shares tips on making sure your dog’s harness is both comfortable and effective. There is no perfect dog-walking equipment—especially from the dog’s perspective. Who among us wouldn’t prefer to be able to go where we want, when we want, at the speed we want? Unfortunately, in the city, some kind of equipment is necessary. First, that’s the law. But also, because behavior is always a response to environmental conditions, it’s never 100 percent reliable. Your dog may have proven his ability to attend to you around squirrels, bikes, and funny hats—but then along comes a squirrel wearing a funny hat while riding a bike and all is lost. My goal is that whatever we’re using for restraint is a backup, and my job as the dog’s walking companion is to make it as unobtrusive as possible. For most dogs, harnesses are my first choice, even if the dog can walk nicely on a flat collar. In particular, of those I’ve had experience with, I like Balance Harness by Lori Stevens (which is what I’m currently using with my own dog) and for management of pulling, the Freedom Harness by 2 Hounds Design. The modular Perfect Fit gets stellar reviews from colleagues, but I haven’t tried it. For very small dogs, I lean toward soft, vest-style harnesses. Many others have written about why harnesses are a good choice, and I won’t spend time on that here. Instead, I’d like to talk about how to fit a harness, specifically some of the popular brands used to deter pulling in dogs who haven’t yet learned to walk on a loose leash. Most of these harnesses have a front clip on the strap that goes across the dog’s chest. When the leash is attached to this clip, if the dog pulls, the pressure he feels encourages a turn to the side. But these harnesses are frequently fitted too loosely and/or with the chest strap too low. When the latter happens, the dogs look (and walk) a bit like they’re wearing their pants around their ankles. Check the photo on the package. Where does the clip go, where does the differently colored strap go, where does the label show? There’s probably a good reason for that. Adjust the strap that goes under the dog’s ribs first. Make it as long as you can. Then adjust the strap that goes over your dog’s back, making it as short as you can. Steps 2 and 3 should ensure that the chest strap has the best chance of sitting above the shoulders, so that it doesn’t hobble your pup. The top and bottom straps, which encircle your dog’s back and ribs, should be snug. The general rule is that you should be able to fit two fingers between the straps and the dog’s body. Looser is not necessarily more comfortable—if you wear a bra, you know what I mean. 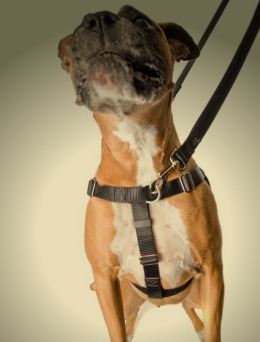 The top and bottom straps should also form a more or less vertical line behind your dog’s shoulders. If they don’t, loosen the strap that goes across the chest. The chest strap should not be so tight that it cuts into the dog’s body, and should not restrict shoulder movement by being too tight or too low. Neither should it dangle loosely in front of the dog. Check to make sure your dog cannot pull a leg up and back through the chest or bottom straps, even if he rolls and wiggles around. Be especially aware of this with short-legged breeds. If you’ve done all of the above and the top and bottom straps are still pulled forward, your dog’s shoulder movement is still restricted, or the front still dangles, consider a different size or a different harness. Many dogs adjust to harnesses as quickly as they do to flat collars, but some balk at having a harness placed over their head. Making the approach of the harness predict a treat, and offering another treat as the harness goes over the head (and/or is buckled), can often change their minds. The Balance Harness and some other brands now also offer versions that snap around the neck rather than slip over the head. Even no-pull harnesses, which make pulling less reinforcing, don’t teach your dog how to walk—that’s your job. Take treats with you. If the dog pulls, don’t pull back. Instead, come to a soft stop and wait (provided he’s not pulling into danger). Immediately reinforce any and all orientation, or reorientation, in your direction, including turns prompted by a no-pull harness—make that pressure an opportunity rather than an aversive for your dog. If the equipment is fitted and handled properly, these two steps alone should lay the foundation for a pleasant walking experience for both you and your dog. Read more training articles and learn more about Kiki’s services at Dog Training by Kiki Yablon.